We purchased this bag as prize at our amusement park, all the patrons who win it love it!! We went with the fuscia and the blue option bags for our order. We were content with the finished product. I would reorder these two colors again. Nice size and design all of the cooler bags look great. I suggest buying this bag, the print quality was great and the poly fabric color was vibrant and its very easy to clean. Extremely impressed with these bags! My clients love them as well! Thank you CEP! Really amazing promotional product here. My business has gotten so much exposure thanks to these bags! I love our bags! They look very professional and are extremely high quality. We are mind blown! These bags are absolutely perfect! Really impressed with these bags! Our logo looks amazing! We ordered these bags for a upcoming promotional event and we are so happy with them! They look amazing. The front pocket is a nice feature we placed our business card and flyer in that pocket when we handed this cooler bag out at a trade show. These bags are so durable. They are extremely long lasting and the insulated lining works really well. 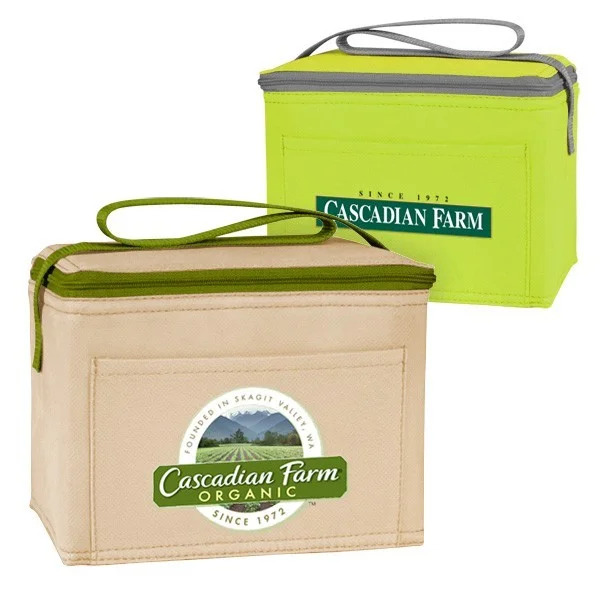 Great way to promote sustainable green living is to give your employees, customers or whomever a reusable cooler lunch bag. It helps so so so much in the fight to save the planet by not using and throwing out senseless plastic shopping bags. Very professional company I have dealt with others and I felt is if I got scammed. I highly advise using custom earth promos they gave me a great product and service. I used there website to order this bag, I called them one time just to confirm the delivery date. We received them on that date and there were no problems, I would use them again. I liked the non-woven polypropylene cooler bag better then the other material, I feel this is more eco friendly looking which is what we wanted to say to our customers. Light purple color was perfect choice for our business it complimented our logo nicely. Great colors offered on this bag, we just stuck with the instock option and got our bags in the time we needed them. Good bag our students love it and use all the time. We reorder every single year from them. Your typical lunch box bag, it works well nothing to say bad about the product of the service we received. We bought this as a promotional giveaway to all of our potential clients the bag was made well and we were proud that our logo was on a well made product. Handle is a different material, it is sewed on strong and the cooler insulation material looks well. The stylish collection of Reusable Drink Cooler Bags from Custom Earth Promos is quickly gaining popularity with startups. It will win over the hearts of your customers with its trendy design, environmental-friendliness, and high level of functionality! Our Reusable Drink Cooler Bag is the best kind of promotional product for your business! Unlike wasteful plastic bags that damage the environment, your customers will be using your customized cooler bag again and again, for years to come! Add eye-catching imprints of your brand name and logo, along with witty slogans to help promote green living. Every time you give one of these coolers to a customer, you help conserve the environment and ensure that your brand name gets recognized wherever your customers go. The Reusable Drink Cooler Bags can be used to promote businesses like hotels, health-care institutions, fitness institutions, and many more! Custom Earth Promos brings you a collection of Reusable Drink Cooler Bags that blend together style and practicality. Made from 80 gram non-woven polypropylene, these bags are durable enough to withstand several years of regular use. The coating also decreases the need for maintenance because stains can easily be wiped off or air-dried. Each bag is fitted with a sturdy handle that can support heavier items without getting detached from the bag. The Reusable Drink Cooler Bags are insulated with foil-laminated PE foam that keeps cold food and beverages cool for longer. 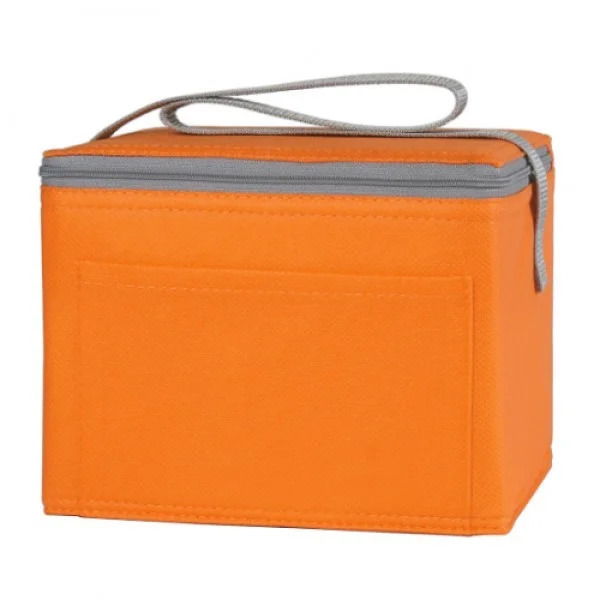 You customers can use them to carry food and drinks for lunch, picnics, outings, and game days. Each bag comes with a zippered closure that prevents the contents from falling out and getting damaged. All our products are tested according to the California Proposition 65 guidelines to make sure they are not contaminated with harmful chemicals. Our custom production factory helps you build your wholesale order of Reusable Drink Cooler Bags from scratch and at the best prices in the industry. Our highly-skilled design team help bring your idea to life by carefully crafting each item according to your design specifications. Through either silk-screen printing or transfer printing process, your customized design is imprinted on the fabric in high resolution. You can choose from an extensive collection of stock images and fonts to create a unique imprint design that matches your brand initiative. Whether your order is for 250 or 25,000 bags, we make sure that you get the best products with premium customer support.